Bears have a long list of wishes from Santa this year. Santa has a long list from the Bears this year. Children are not the only ones hoping Santa Claus can bring them all the items on their wish-list. Sports teams have compiled a list that they hope the jolly old man may put under their Christmas tree. OK, maybe they don&apos;t have a list, but here is what I think they want — it’s not sugar plums and candy canes. The Bears, and specifically Head Coach Lovie Smith, have a long list of wishes. A playoff berth is top on the list in big bold letters. Smith’s future here as the Bears head coach may be tied into a postseason appearance. Winning the last two games and loses by other teams may get them in the playoffs (lots of work for Santa). General Manager Phil Emery must have plenty of wishes, too. High on his list are numerous offensive linemen, a wide receiver and a sure-handed tight end. Basically he&apos;s dealing with the personal that former GM Jerry Angelo left for him. It&apos;s not hard to figure out what the Cubs would love to get: wins — lots and lots of wins. It is probably on top of every Cubs fan&apos;s list, too. Team President Theo Epstein and General Manager Jed Hoyer have been filling out the roster with some free agents: Scott Baker, Scott Feldman and Japanese closer Kyuji Fujikawa. Face it: The Cubs are going to be a struggle this year maybe the next, so wins may be on the team’s wish list for a few holiday seasons. Cubs owner Tom Ricketts may have something bigger on his mind: a plan for renovations for Wrigley Field. Is it time for Mayor Rahm Emmanuel to stop being a Grinch and start getting down to business at Clark and Addison? On the South side, the White Sox wish is for fans over two million strong to move the turnstile this year. It would be nice since attendance has been on a decline for the past few years. Last season the Sox were in first place in the AL Central most of the year, but were one of the worst teams in baseball in fan attendance. With reduced ticket pricing and other fan-friendly deals ($10 parking on Sundays) maybe the numbers will improve; they also have to be competitive again on the field. Winning the American League Central would be a real present. It is not hard to figure out what the Bulls want to see under their Christmas tree: a full-strength and fully recovered Derrick Rose. That may be a tall order for Santa to handle. No one knows for sure when that will happen. So, maybe a trip to the All-Star game for Joakim Noah would be a nice gift. Fans can help Jolly St. Nick by stuffing the All-Star ballot box — put votes in for Luol Deng, too. Another wish would be acquiring another major star player to complement Rose’s return. Now that’s a big wish. The Blackhawks and their fans have one wish: a season. 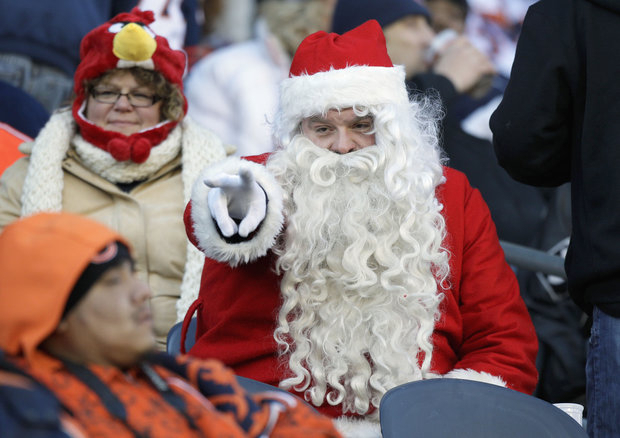 Santa’s magic has to extend at least another week to make a special News Year’s Day for the Northern Illinois Huskies. They want to upset the Florida State Seminoles in the Orange Bowl in Miami. On that same day, Northwestern University head coach Pat Fitzgerald would love to snap the Wildcats bowl losing streak at the Gator Bowl in Jacksonville Florida (NU is facing Mississippi State). Keeping the win column filled with victories is the hope of the Illini basketball team; they got a nice present when they hired John Groce to coach the team. DePaul, Loyola, Northwestern and UIC (men’s and women’s teams) are all hoping they get wins on the hard court floor to fill their stockings (and maybe some front-line recruits). It would be great if Santa gave Northwestern’s women’s lacrosse team another NCAA Championship and let the Chicago Sky finally compete in the WNBA playoffs. Of course, there will be coal put in at least a couple of stockings…the NHL&apos;s and Lance Armstrong&apos;s.
Whatever you celebrate, may I wish each and every one of you a Happy holiday season! Hope those going through tough times will find comfort and may your hopes and dreams come true. I still believe!